Mobile technology specialist Blue Bite, in partnership with Creative Mobile Technologies (CMT), is planning to bring NFC support to taxi screens. 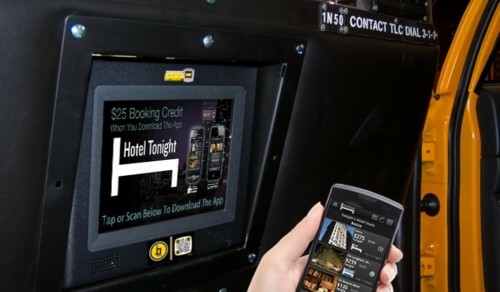 According to a report from Digital Signage Connection, CMT already provides digital out-of-home network and payment processing solution for the taxicabs. The mTAG solution with Blue Bite, however, will enable riders to do much more than pay their fare. Blue Bite’s mTAG solution works by first showing taxi riders a video or static message on the CMT taxi screens, prompting them to tap the mTAG – using NFC – on the frame of the screen. Upon tapping an NFC-enabled smartphone, the rider can instantly download content including music, videos, mobile apps, promotional information, coupons, maps and tips. Blue Bite and CMT are also remaining mindful of those consumers who have yet to jump onto the NFC bandwagon. Those without an NFC-enabled phone can “snap” a picture of the Quick Response (QR) code to access the same content. Blue Bite’s mTAG solutions is expected to push September 1 to 5,000 CMT-screen taxicabs across New York, Boston, Chicago, San Francisco, Philadelphia and Anaheim. The partnership is seeking to take advantage of the out-of-home market, which has grown to become a significant segment of the advertising industry. By leveraging CMT’s geo-targeting capabilities and combining it with full motion video and audio and ABC’s dynamic content Blue Bite will provide the means to access the out-of-home consumer via their smart phones or similar mobile devices. Blue Bite will also provide real-time mobile content analytics, allowing participating companies to better tailor their ad campaigns and adjust to fluctuations in market climates. On the consumer end, content will be location-specific and relevant, and will provide the ability to share the ad campaigns with friends via social media.